I plan life in my head. The way I orchestrate things in my mind goes according to logic, what is most efficient, how it flows thematically, what gives the best return. God’s ways are higher than my ways (to the relief of all). What do we do when things do not go according to plan? When our very best efforts and intentions yield exactly nothing? Or when the compensation for all the thousands of hours of labor doing the same faithful work tirelessly day after day is an unseen investment? The papers are scattered across the table, detailing what we’re worth, and it’s a mess. We have a folder of items to sort through that put numbers to our value. At the end of the day it’s a sum of digits we can put in the bank for a rainy day. But in the torrential downpour of what-ifs and maybes we are soaking wet, right through the shirts on our backs till the flesh shows through. When trials hit hard—our worth is laid out on the table and it’s not much more than a mess—a person gets desperate. And when people are desperate they suddenly need a god. That’s when the prayers of saints sound more like pleading agreements that bargain for our side and make deals we could never hold up. Our instinct is to pray. So we get down on our knees in those old worn torn jeans, the ones with the hole on the right knee that always needs mending. And we do. What is really needed is to lay down arms and bare hearts, to stop accounting for the deficits,because all that we really need to do is recount the promises. Bargaining agreements may get us to the bank, but the solid gold guarantee of this lifeis found only in the Word of Life who laid down his life as a promise that we get eternal life at his return. It is never about how much we invest or what we yield up for our labors. It is always about the promises that out number the grains of sand, an everlasting seal of warranty that trades in a busted up life boat for salvation’s shores of glory. We regroup and pick up the pieces laid out on the table. We see that we have enough and we will not be left torn apart. Then we go to a cafe and order breakfast. 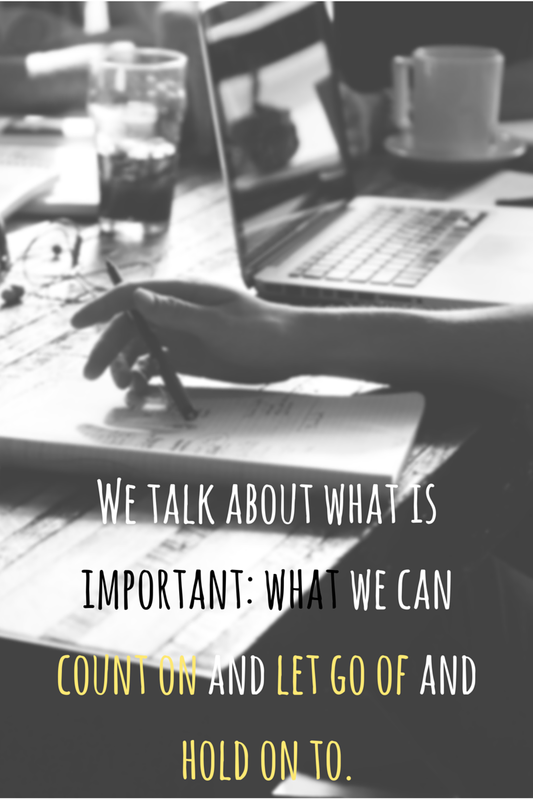 We talk about what is important: what we can count on and let go of and hold on to. We don’t scatter our energy talking about the future, because today is all we have. Today is enough. We can count on three fingers what can be “counted on”. Three of us in this family that matter first and most. Three scars on holy hands and feet. Three days in the grave then raised to life. We let go of bitterness that binds the heart of yesterday. We let go of control over today. We let go of fear about tomorrow. We hold each other’s hands on the good days and hold each other close in the dark. We hold on to the promise that the One who bares the scars will never leave us nor forsake us. We hold on to the Word who is the same yesterday, today, and for all our tomorrows. These are promises we can take to the bank. Previous Words of Promise. Worship with Purpose.